http://foreignwant.space/2018 gary webb death My photos are up over at nineteen days, the photoblog about the Baha’i Fast. Check it out, leave a comment (here or there), and definitely check out the photos from the 6 days of the Fast so far. I’m stunned at how amazing the other contributors are. 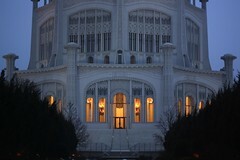 i hinandens hænder I went to the Baha’i House of Worship at around 6 am this morning to take photos for the “sunrise” photo. Unfortunately, the weather was not cooperating and I was scrambling to find a decent shot. I finally got some, but I was worried that none of them would work out! lijn gewicht bepalen The “sunset” photo was a bit easier, since the barista was a rather pleasant gentleman who suggested that I come behind the counter to avoid shooting through the glass. Thanks, if you get a chance to read this! wespennest im rolladenkasten was tun As I did errands tonight, the towns around me slowly filled with fog. It would have been perfect for some photography, but it was already too late and I had groceries in the car. Another time, I hope. I love fog, it makes everything a little scary and closed in.